The day was somewhere in early winter 2008 when I had a light bulb moment that has changed the course of our lives. But to tell my story I need to take you back a little further – 12 years ago. That year, long ago, we made an offer on a farm where we hoped we would find the space, freedom and the agrarian lifestyle we longed for. But the deal fell through as there was a problem with the water supplies. We were going to grow grapes and without water... well, that would be hard. From that time I would look wistfully out my car window every time we were driving through the beautiful farmlands in South Africa dreaming of “if” and “when” we got all our ducks in a row to purchase our farm. The following 12 years saw us having sporadic bursts of looking at small holdings and farms. We also changed tack and decided to look into olives and lavender growing and did lots of research into these crops. We had offers in on two more small holdings, but both of them never came to fruition. Our main issue is that we were also limited in how far from the CBD we could go as my husband would have to continue to work while I farmed, at least until the farm was breaking even. 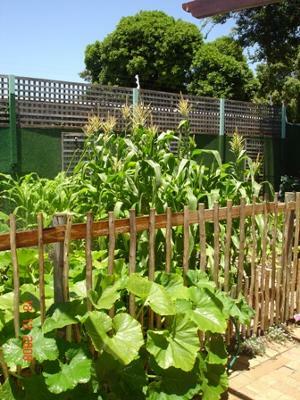 Fast forward to 2008 – while surfing the net one day I came across the term “Urban Homestead”. A quick Google search and I ended up at www.pathwaytofreedom.com and this little site, and the Dervaes Family testimony has set us on a new course. For the first time I looked at my 900sq meters of earth with new possibilities. I began to see that I didn’t need flower beds and even our paved areas could produce food for us in tubs. So began the great conversion of our little erf into a food producing garden. In a matter of weeks our few rose bushes, a Bay tree and a small patch of lawn were uprooted and replaced with raised beds for vegetable growing. My back yard received half wine barrels for fruit trees with strawberries in the bases, tyres were collected to grow potatoes and seeds were sown for late winter plantings. By December we were eating all our salads out of the garden, had dined on fresh broccoli and had some great spuds! Corn followed in January as well as carrots, tomatoes and globe artichokes. Beans were grown outside on a trellis, chillies wherever we could, melons and squash flowers replaced roses! It has become a family effort as each Sunday before the sun got too hot we all weed and sow and enjoy our food growing endeavours. Our goal is to be able to eat 50% of all our vegetables from our garden in the second year of growing our own veggies. So with this goal in mind we cleared a second patch of hedges and planted corn, sweet potatoes and potatoes to see us through autumn and early winter. We also planted berries and a grape vine to grow along the fences. Fences were a necessary evil for us as we have 3 dogs who would trample everything as well as the darlin’ chickens who tend to eat the shoots of anything. The chickens we added to our family in July. The “girls” have kindly been supplying us with 4 eggs a day, which having seen and tasted, we will never buy shop eggs again. I no longer look wistfully out my windows at farms... I have created a little farm, just for us, right outside my kitchen door. So if the only “green people” you have met are really weird and make you feel like you have to opt out of society, live in a commune and become a vegetarian then you may want to follow my journey into a simple green lifestyle as pursuing a self sufficient lifestyle is for everyone – no matter what your age, creed, race or religion is. It’s for you whether you live in an apartment, in a small home, in a rural area or on a farm. Sufficiency says: "What I have right now is good enough!" This therefore became one of my mottos and what we have lived by for a year... Still in the middle of a city, on the same 900 sq meters, but with a different outlook on life. "Living simply is not about giving things up, forsaking them, frugality, denial, stinginess, deprivation or lack. It's about taking things up: self-determination, freedom, autonomy and abundant living." Linda Cockburn. Faaantastic Wendy. You deserve every success for your determination to bring your dream to reality. After all true happiness and contentment is wanting what you have.